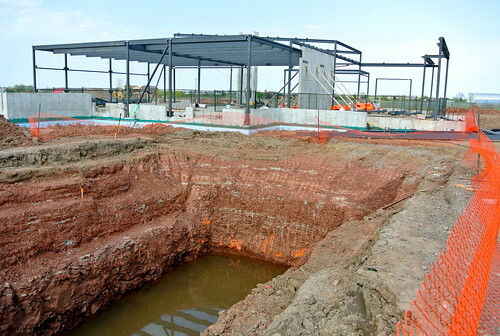 It has been emerging from the bright red soil along Old Highway 8 since early spring, the eye-catching design starting to take shape at what will become Niagara’s newest winery. Redstone Winery is Moray Tawse’s “Bordeaux” answer to his “Burgundy” focused varietal winery not far away in Vineland. 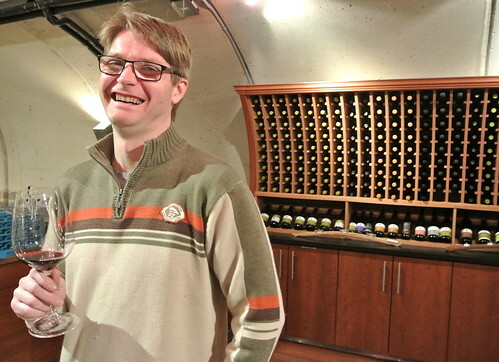 They two wineries may be close in proximity but the portfolios will be vastly different, says Rene Van Ede, in top photo, who has spent a great deal of time working with Tawse winemaker Paul Pender and is now head winemaker at Redstone. 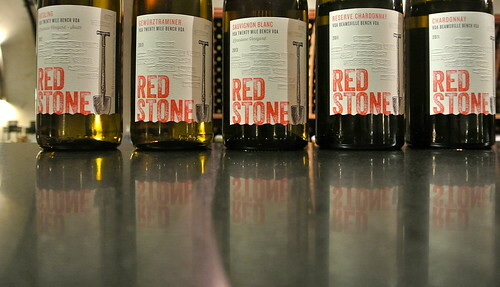 While the focus of Tawse has always been single-vineyard Chardonnay and Pinot (with a little Riesling, Cab Franc and sparkling for good measure), Redstone is better suited to the Bordeaux varieties of Cabernet Sauvignon, Merlot and Cab Franc (with a little Pinot Gris, Riesling, Sauvignon Blanc, Syrah and Gewurz). “Moray is a terroir freak,” says Van Ede. “He loves the concept of terroir” and believes the old Thomas & Vaughan property (across the road from Malivoire in Beamsville), is rife with the personality it takes to make bold reds that will stand distinctly apart from his other winery’s core products. Moray purchased the Lincoln Lakeshore property in 2009 and viewed it as an opportunity to explore a different terroir. He was inspired by the red dust, which covered everything (including his boots) the first time he strolled in the vineyard. The intense red clay soil and large stones gave rise to the name for the winery. It’s a 38-acre vineyard, farmed organically and bio-dynamically, like his namesake winery’s vineyards, and is perfect for maturing late-ripening varietals including Merlot, Cab Franc, Cab Sauv and Syrah. The rest of the portfolio — Riesling, Pinot Gris, Sauvignon Blanc and Chardonnay — will be drawn from the recently acquired Limestone Ridge vineyard. Construction of the state-of-the-art winery, hospitality centre, seasonally inspired restaurant and patio is in full swing after a few delays. The team is still optimistic about a late fall opening but it seems more likely in a year from now. I tasted through the wines Redstone and Van Ede have made thus far and this is what I can recommend (note, while the winery is being built, wines can be ordered by calling 905-563-9463 X 201 or e-mail shipping@redstonewines.ca. The website is still under construction). Redstone Sparking Wine 2011 ($25, 88 points) — A blend of Chardonnay, Pinot Gris and Pinot Noir sourced from various Niagara vineyards and made in the traditional method and aged 18 months on the lees. The nose shows soft peach, melon and citrus notes. It has lovely texture on the palate and is built in a richer, rounder style with creamy melon. stone fruit and a fine vigorous mousse. 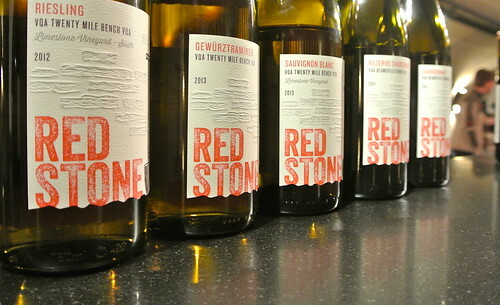 Redstone Riesling 2012 ($19, 89 points) — From the estate’s Limestone Vineyard South on the Twenty Mile Bench. The fruit from the Riesling in this vineyard is split between north and south with half going to Tawse and half going to Redstone. The nose shows penetrating notes of lime, grapefruit, quince and a lovely floral note. It’s round and succulent on the palate with honey-kissed grapefruit and lemon-lime flavours that find balance from the acidity. Redstone Chardonnay 2011 ($32, 90 points) — I tried both the regular cuvee and the reserve version of the Chardonnay but am only reviewing this one as the reserve was shut down and tight when tasted. This Chard, a sourced vineyard blend all from the Beamsville Bench, was made using wild fermentation and aged for 12 months in French oak. The nose shows pear, citrus, juicy apple and stylish oak spice and subtle minerality. Pear fruit and balancing spice dominate on the palate of this elegant and juicy Chard. 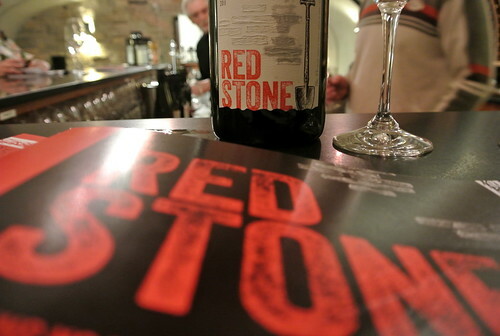 Redstone Merlot Redstone Vineyard 2010 ($40, 91 points) — “This is the wine that really defines Redstone,” says Van Ede. The vineyard, planted in the late 90s, is named for its heavy red clay soil and large stones. It’s farmed organically and biodynamically and is suited for maturing late-ripening varietals such as Merlot. It has a beautiful nose of black cherry, bramble, raspberry, violets and gorgeous spice notes. In the mouth there is no doubt this is a big and meaty Merlot with fine tannins and structure to go with plums, cherries, earth, bramble and an array of spice notes. Might want to hold on to this for a few years, though would pair well with a big hunk of grilled red meat now. Redstone Reserve Cabernet Franc 2010 ($30, 89 points) — From sourced fruit in the Lincoln Lakeshore sub-app. The nose shows cherry, currants, herbs, cedar and pepper notes. It gets really interesting on the palate with red and dark fruits working in tandem with fine herbs, tobacco, smoke and licorice. A very interesting CF with plenty of tannin and oak structure and length through the finish. 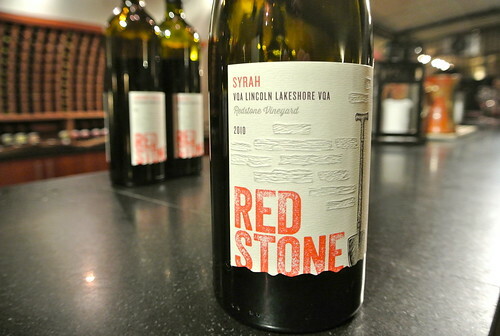 Redstone Syrah Redstone Vineyard Syrah 2010 ($40, 91 points) — Grapes come from the original Thomas and Vaughan Vineyard (now Redstone) planted in 1998. Such a beautiful nose of peppery red fruits, earth, bramble, tobacco and spice. This is heady stuff on the palate, a gorgeously built Syrah with red and dark fruits, cracked black pepper, graphite, cedar and lavish spice notes that adds plenty of length through the finish. “This is one of the grapes that makes Redstone different” than Tawse, says Van Ede. Redstone Meritage 2010 ($40, 90 points) — The blend was assembled from equal parts Cabernet Sauvignon and Merlot from the Redstone Vineyard and Cabernet Franc from the mature vines of the Van Bers Vineyard. The nose displays rich red fruits, spice, plums, black currants and blackberries. It is textured and lush on the palate with some smoky-meaty notes and earthiness to go with dark, ripe fruits, wonderful spice and firm tannins. 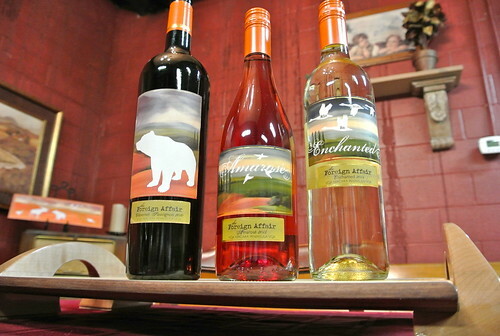 Foreign Affair keeps pushing the envelope with its appassimento-styled wines and has created two new wines that continue to set this winery apart in Niagara. Amarosé is an Italian wine lover’s answer to rosé, made with partial appassimento (dried grapes). Pinot Noir forms the base wine with Riesling, Sauvignon Blanc and Chardonnay, all partially dried, making up the rest of the wine. The Chard was the only varietal that sees oak aging in the blend. 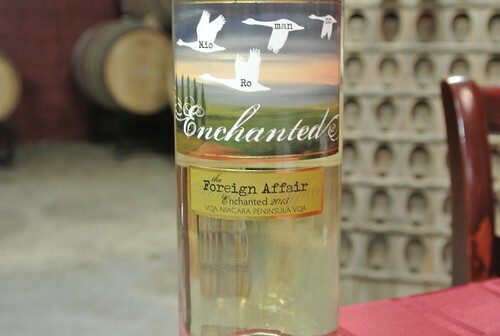 The Enchanted is Foreign Affair’s white wine answer to the popular Conspiracy, a Ripasso-style wine. Enchanted combines Sauvignon Blanc and Riesling. Foreign Affair Amarosé 2013 ($19, winery now, Vintages in August, 89 points) — A complex and heady nose of strawberry short cake and raspberry pie that is bold, rich and inviting. It is textured and layered on the palate with concentrated and lush red fruits followed by a squirt of citrus on the finish. Foreign Affair Enchanted 2013 ($18, winery, 88 points) — A luxurious nose of grapefruit, lime, citrus and integrated herbs and spice. It reveals freshness and energy on the palate with a full array of citrus fruit and just a hint of grass and herbs. 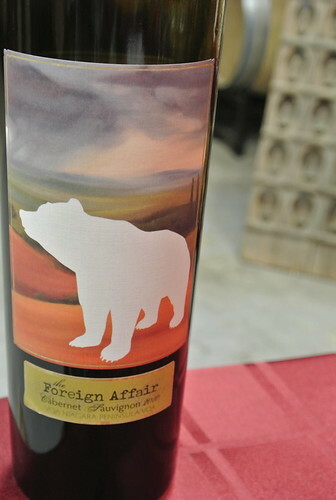 Foreign Affair Cabernet Sauvignon 2010 ($35, winery, 92 points) — 40% of the fruit was dried and the wine was aged for 18-20 months in a combination of French, American and Hungarian oak. It has a deep, dark burgundy colour in the glass and reveals rich black currants, graphite, dark plums, mocha, nutmeg and cassis fruit. This is a big, bold, rich and nicely aged Cab at this point with flavourful dark fruits, a mouthful of spice and persistence through the finish. It’s a heady wine, thrilling in fact, if you like your wines with power and personality. Cellar or drink now with boldly spiced grilled meats.